The typical florentine style of the Machiavelli Palace Hotel, once an ancient convent built in XIV century, transformed into a Palace, can make your stay in Tuscany unforgettable.Our charming rooms with terracotta flooring and wood beamed ceiling,together with modern facilities will provide you with all comforts you may need to spend your time in the best possible way and our staff will be at your disposal for every needs. The typical bar lounge with frescoes and the nice solarium rooftop with view on the Cathedral, are the best places where to relax having a drink,reading a book or browsing on internet with our wireless connection. 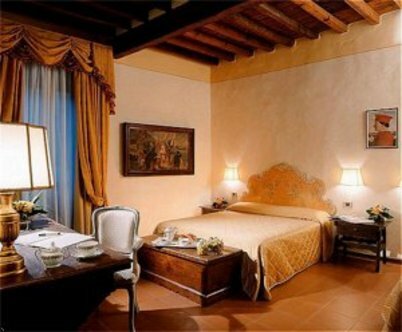 The Hotel is located in the historical centre of Florence with easy access by car, walking distance from the train station, congress hall, exhibition centre and all the most important historic and artistic city attractions.